Caves are underground voids	which are large enough for human to enter - in Latvia it is traditionally presumed that cave should be at least 2 metres long from the entrance. Category includes niches as well - these are hollows which also are at least 2 metres deep but the entrance is wider than the depth. If the passages of the longest known cave in the world - Mammoth Cave in USA - are approaching to 600 km length then the longest known cave in Latvia - the Big X Cave - is "just" 346 metres long. 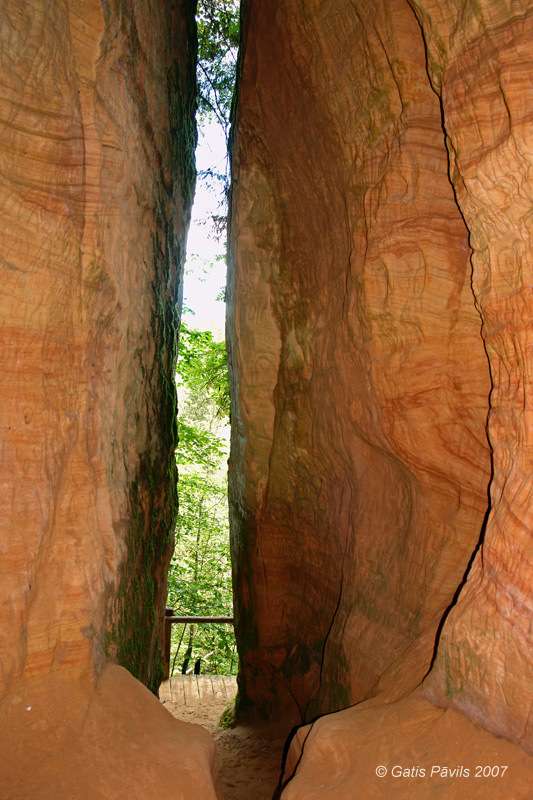 Major part of approximately 300 discovered Latvian caves are much shorter - just a few metres long. Such short length is explained with the fact that caves are formed in brittle, crumbly sandstone rocks. There are known just a few caves in harder rock - in dolostone and dolomitic sandstone - but these caves are short as well. There exists a possibility to discover longer caves in Latvia. Thus, for example, sinkholes in surroundings of Skaistkalne village have formed when caved in large underground hollows. It could be considered that most of these hollows have not caved in - one day someone will enter inside long caves which possibly are adorned with stalactites. May be somebody has entered such caves already and keeps this adventure in secret. Knowing the level of awareness of society in Latvia such conduct would be easy to understand and to support. Environment and charm of caves is very fragile. Author has experienced the degradation of the Big X Cave over the last decade. If in 1998 this cave was comparatively little known and it left mighty impression with its primaeval enchantment now this enchantment is lost irreversibly. If you happen to find a little known cave - better don't tell much about it to others - people will not loose much and the destruction of cave environment will be delayed. Let's leave to tourists those comparatively numerous caves which are included in popular tourist routes. Brunis cave - 21 metres long cave in dolomites. Cave has got a form of crack and it is possible that it has developed in tectonic processes. Located in Cesis district, Amata region. 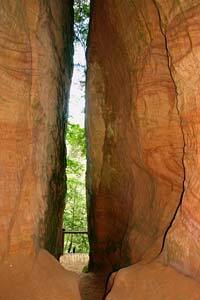 Cirulisi abyss - This vertical, 6 metres deep sandstone hollow is very unusual for Latvia. Located in Cesis town. Gutmanis Cave - Cave with the largest volume in Latvia, most popular and best known cave. Ancient cult site, walls are covered with inscriptions created in different times. At the beginning of 20th century there were seen inscriptions from early 16th century. Cave is 18,8 metres long, 10 metres high. Located in Riga district, Sigulda. Livic Sacrifice Caves - since the collapse of the entrance part in 19th century former cave has divided in two smaller ones. Ancient cult site. On the walls of one cave - the first discovered Latvian petroglyphs (discovered in 1971) as well as the oldest dated cliff inscriptions in Latvia (1642). During the excavations in the cave have been found numerous artefacts. In the ceiling are seen so called "Devil's chimneys" - narrow, deep hollows. The longest cave is 47 metres long, the smallest one - 18,5 metres long. Located in Salacgriva rural area, Limbazi district. The Large Bat Cave - 64 metres long cave in dolomites. Earlier in the cave there was located one of the largest bat colonies in Baltic states. The Big X Cave and The Small X Cave - two longest caves in Latvia - correspondingly 346 metres and 159 metres long. Outstanding, very impressive natural landmarks. Located in Valmiera district, Mazsalaca. Liepa Big Ellite Cave - 22,3 metres long, impressive cave, sandstone arches at the entrance. Legends linked to this cave - possibly testifying that this has been ancient cult site. Located in Liepa municipality, Cesis district. 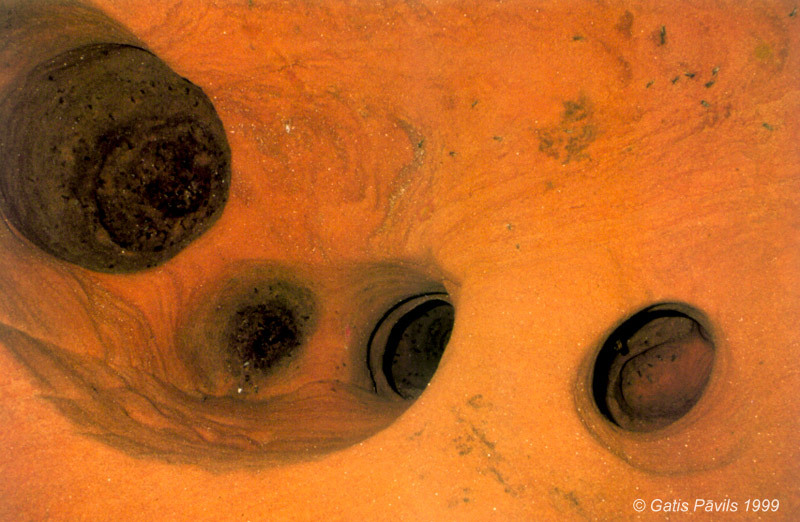 Mazsalaca Devil's Cave and Devil's Sourness Churn - unique system of caves, ancient cult site. At the level of Salaca river there still exists Devil's Sourness Churn - 17,8 metres long cave with spring. Part of former cave due to gradually collapsing ceiling has risen up inside the cliff and now this part has got entrance from another side of the cliff. Length of this cave - 16,4 metres. Located in Mazsalaca town, Valmiera district. Patkuls cave (Stoki Cave) - 80 metres long cave with complex system of passages. Possibly an ancient cult site with petroglyphs. Valmiera district, Vaidava municipality. Peldanga labyrinth (Liepniekvalks caves) - 70 metres long cave, longest cave in Courland. Located in Talsi district, Dundaga municipality. Peteris Cave - Unique cave for Latvia - shaped as an enormous, vertical trench. 6,2 metres deep. In 1997 on the walls of cave, high above the floor there was found a group of petroglyphs. Riga district, Sigulda. Sigulda (Krimulda) Devil's Cave - artificially prolonged, 35 metres long cave. Ancient cult site, petroglyphs on the walls. Petroglyphs have been partly destroyed in 1992 when the "White Brotherhood" searched for "temple" here. During these works the original floor of the cave still was not reached. Riga district, Sigulda. Simteni (Dzirne) Cave - at least 40 metres long, unusual and impressive cave. 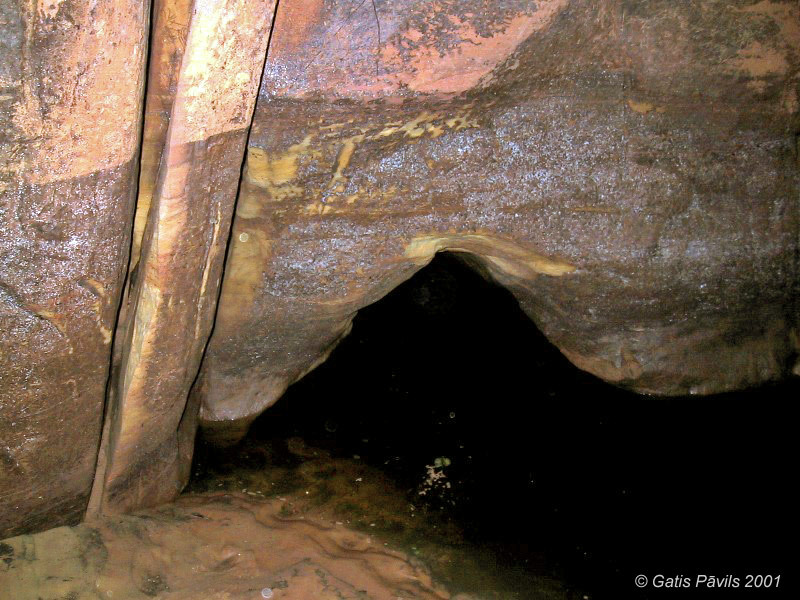 Cave has been studied by amateur R.Dzirne before the 2nd World War - he found remnants of potential human settlement there. Further studies have not taken place. Vejini Lake Cave (Brasla Lake Cave) - 48 metres long cave system with underground stream and two underground lakes - the only known underground lakes in Baltics. Cesis district, Straupe municipality. 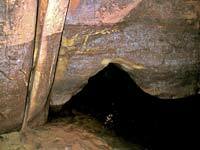 Below are listed all the caves described in this website. Each column in this table is sortable by alphabet - just click on the header of the table. The first column - "No." - gives an order of appearance of the landmark in this website.